Several people have asked me about the name I use. Alvarez and Fernandez Casas raised this plant to species level and applied the name lusitanicus a few years ago (2000). Before that it was called N. triandrus var. aurantiacus or N. triandrus var. concolor. 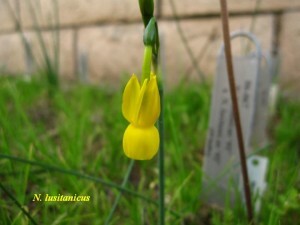 The RHS considers the correct name to be N. triandrus subsp. lusitanicus. This is one occasion that I agree with Fernandez Casas and feel the RHS is incorrect. 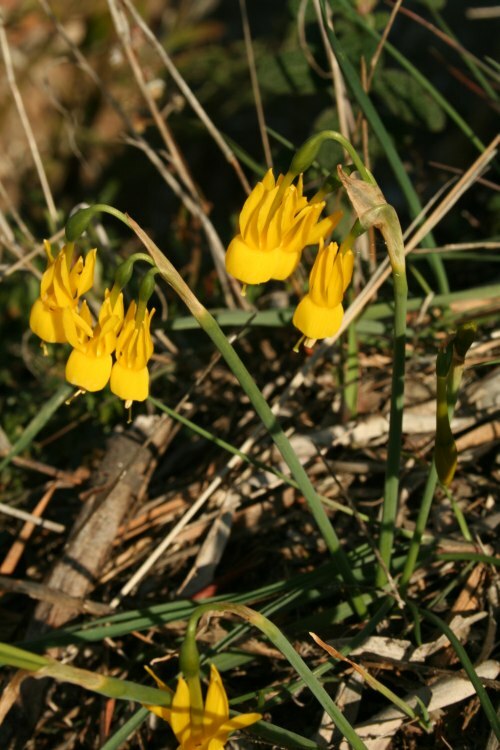 Narcissus lusitanicus should not be confused with the dark yellow forms of N. triandrus subsp. pallidulus. I have never seen a pallidulus with the intensity of color that occurs in lustitanicus and once spent a spring looking for intensely yellow pallidulus forms, although sometimes according to Mary Lou the two types occur together but I have not seen that. Narcissus lusitanicus is the earliest of the group to flower, usually a month, before the others and has very slender green, never glaucous leaves. The average flowers are much smaller than the average size for pallidulus or triandrus triandrus and usually are only one to the stem. My guess is that when the scientists get around to looking at their genes they will find that pallidulus originated as the hybrid between triandrus triandrus and lusitanicus. In his classic paper based on chromosome morphology A. Fernandes (1975) also considered N. lusitanicus a good species although he called it N. concolor. Unfortunately that name is inadmissable having been used earlier for something else. I am sure this is more than anyone wanted to read! The attached photo was taken in Portugal in 2008, and clearly shows one pale colored flower. Whether it is N. triandrus pallidulus or just a pale form of N. triandrus subsp. triandrus var. concolor, I don’t know. But it was interesting to see. The RHS still lists both N. tri. subsp.tri. var. concolor and N. triandrus subsp. lusitanicus as valid names, so they have some sorting out to do. This is a very interesting photo. My various plants of N. lusitanicus over the many years, never have such robust leaves. There were quite a lot of them in this area, Harold, most with more florets per stem than I’d seen in other places. It appeared the area had been cleared, as there were the remains of tree trunks to be seen. the paper from Ben Zonneveld supports your theory and he list N. lusitanicus as a seperate species with a different DNA content (weight). With N. lusitanicus at 16.9pg, N. pallidulus at 18.1pg and N. triandrus at 19.1pg, your theory of N. pallidulus being an ancient hybrid is well supported. He considers all to be established species. The interesting physical differences between the species, other than those listed by Harald, should make it relatively simple to sort them in cultivation, with both N. lusitanicus and N. pallidulus having leaf widths of 2mm, while N. triandrus has 4mm wide leaves. The flowers of N. pallidulus are pale yellow, N. lusitanicus deep yellow, while N. triandrus can have bi-colour, concolour or white flowers and seems to show the most variance. Mind you, I’ve never seen wild populations and mixed populations have been observed. Hybrid swarms may be common. In any case, via these differences, one can at least give plants a good name. His paper is an interesting approach to understanding genetics and the method is a great way to sort entities into specific taxa for further study. If some of you haven’t yet read it, it can be read or downloaded from the ADS site. Here is a direct link. I found one needs to read it quite a few times to truly appreciate the analysis of the genus. I find it a great reference. I had discussed the method briefly with Ben about 4 years ago, when he started the project, as I was trying to make some sense of Hemerocallis species at the time. The proplem is, as always, having good provenance of the test plants. With Hemerocallis, this was close to impossible and still is today, as the most come from China, Korea and Japan, where they have long been cultured. True ‘species’ are problematic. Re-doing Ben’s work with known populations would be an interesting follow-up to his work. Especially with the jonquilla group, as the DNA weights are very close. Additional work with chromosome counts (especially for B chromosomes and fragments) and analysis of the karyotype would bring quite a bit more light into the area. I always ask myself, how much does one NEED to know, in order to be a successful hybridizer (profi or hobbiist). With the work already published, I find one can certainly base an excellent program founded on sound science. It will save one from many futile crosses and help one understand why a specific cross didn’t seem to take. As well as understanding the exceptions to the current rules.
" 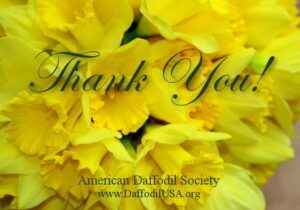 type="cite">Several people have asked me about the name I use. Alvarez and Fernandez Casas raised this plant to species level and applied the name lusitanicus a few years ago (2000). Before that it was called N. triandrus var. aurantiacus or N. triandrus var. concolor. The RHS considers the correct name to be N. triandrus subsp. lusitanicus. This is one occasion that I agree with Fernandez Casas and feel the RHS is incorrect. 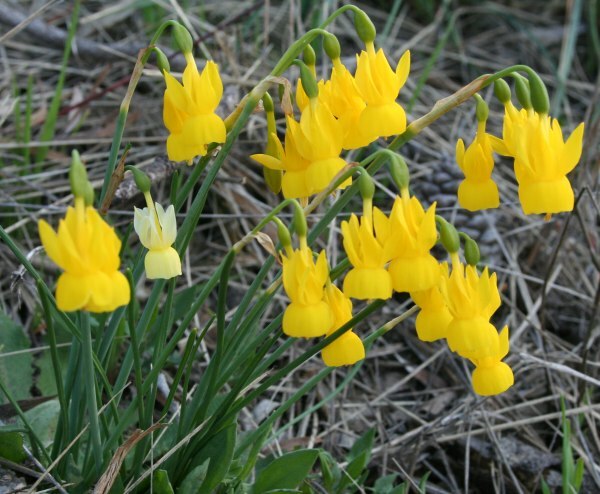 Narcissus lusitanicus should not be confused with the dark yellow forms of N. triandrus subsp. pallidulus. I have never seen a pallidulus with the intensity of color that occurs in lustitanicus and once spent a spring looking for intensely yellow pallidulus forms, although sometimes according to Mary Lou the two types occur together but I have not seen that. 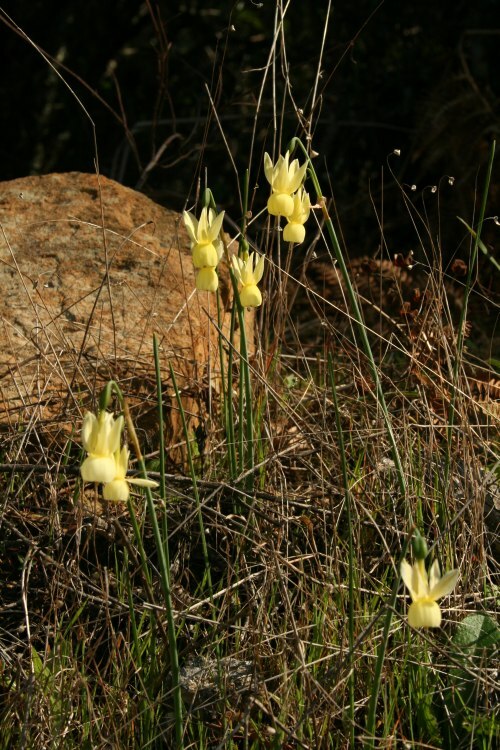 Narcissus lusitanicus is the earliest of the group to flower, usually a month, before the others and has very slender green, never glaucous leaves. The average flowers are much smaller than the average size for pallidulus or triandrus triandrus and usually are only one to the stem. My guess is that when the scientists get around to looking at their genes they will find that pallidulus originated as the hybrid between triandrus triandrus and lusitanicus. 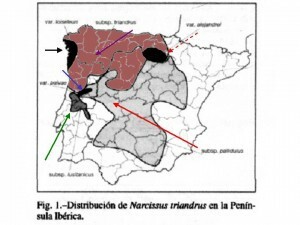 In his classic paper based on chromosome morphology A. Fernandes (1975) also considered N. lusitanicus a good species although he called it N. concolor. Unfortunately that name is inadmissable having been used earlier for something else. I checked the lusitanicus leaves this morning. They all have single terete leaves not flattened like Mary Lou’s picture and less than 2 mm wide. I wonder if perhaps the flowers in Mary Lou’s wonderful photo are of a hybrid swarm? There were lots of the deep gold triandrus concolor in the area, but the photo I sent was the only instance we saw of a pale one. Attached is another photo from the same area, Portalegre; and a second photo taken in 2005 from an area around Montegordo. I don’t know if the leaves show up enough well enough for you to tell anything. 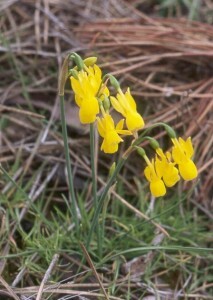 The attached photo is of N. triandrus subsp. pallidulus, also taken in Portugal in 2008, in a different location from the concolor. Foliage on these is much thinner than on triandrus concolor. These both have the typical lusitanicus leaves which sprawl and are not erect like the first photo. I would like to add one more thing. The time when we say SO many lucitanicus in Montegordo was after fire. There were 3-4 hillsides with them. Many with 2-3 blooms per stem. When we returned several years later and the brush had grown back, there were not as many and they were less robust. Agreed. And the ones at Portalegre seem to have been in a recently cleared area. Either fire or man-made, as there are tree stumps visible in some of my photos. Which raises the question: does the ash from the fire promote the daffodils, or is it the added sunlight that helps? 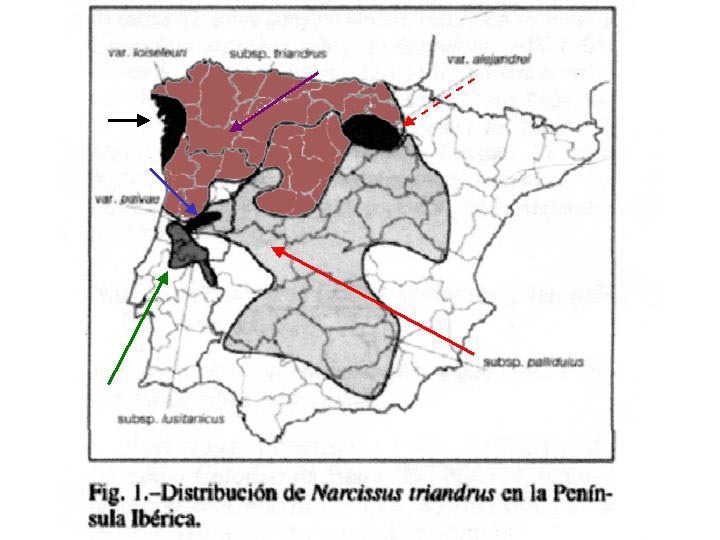 For those interested, I am attaching the distribution map for N. triandrus in the Iberian Peninsula published in Anales Jardin Botanico de Madrid, 58 (1), page 184, (2000) by Alfredo Barra Lazaro. On page 186 he also gives the keys for the subspecies and varieties. Please note that parts of the map were accidentally colored reddish brown and should be white. They are parts of the following provinces: Zamora, Valladolid, Segovia, Avila. Burgos and all of Palencia.